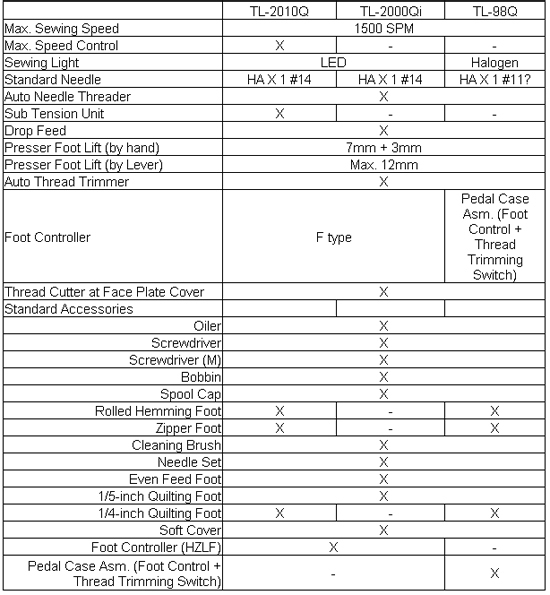 1-Foot Pedal for Speed Control by Toe, Thread Trim by Heel. Note: Juki TL2010Q has a built-in, on board Speed Limit Control slider as well as Variable Speed Foot Control. Juki TL2000Qi and Brother PQ1500S do not have Speed Limit Control but do have Variable Speed Foot Control. .
Juki's updated quilting and home deco machine. Powerful 1500 SPM machine, low vibration due to the aluminum die cast frame and with automatic thread cutting. LED lights and one pedal control for speed and trimming system complement this semi industrial sewing machine. Famous stitch quality with true drop feed used by many of the best quilters. This workhorse machine comes with a 1/5 inch quilting foot and even feed foot and extended bed table. Up to 12mm foot left, easily hems denim jeans. 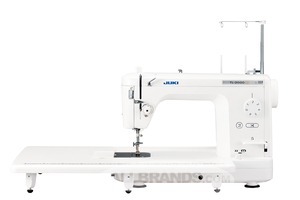 The NEW Juki TL-2000Qi is a high-quality sewing and quilting machine. The TL-2000Qi is a portable, lightweight machine, constructed of aluminum die-casting to ensure industrial-quality sewing. With a large work area of up to 23 inches (with auxiliary table attached), the TL-2000Qi can handle large quilts and home decor project with ease. Arm and bed of Juki TL2000Qi is contructed of aluminum die-casting. Large work area - wider handling area than conventional sewing machines. Home Video of prior model Juki TL98Q speed and sound. Advanced Thread Trimming The New TL-2010Q allows you to trim top and bobbin threads using the Exclusive foot controlled trimming system. Just rock your heel back on the foot control, and thread is quickly and precisely cut. Automatic Thread Trimmer The machine is equipped with an automatic thread trim button that simultaneously trims the needle and bobbin threads with a gentle push of the button. Both the Trim Button and the Foot Controller engage the advanced Juki industrial style thread trimming mechanism. Thread Tension Scale The TL2000Qi has the thread tension scale, which allows you to adjust the tension according to the thread and material to be used. Presser Foot Pressure Adjustment Presser foot pressure can be adjusted according to the fabric being sewn by turning a regulator located on the top of the machine. Materials are sewn with Ease The microcomputer controlled, speed control mechanism, allows the machine to sew materials at low speeds. This provides for accurate feed and perfect stitching when sewing heavy weight fabric, quilting and multiple layers of materials. Needle Up/Down Control When you stop sewing, the machine will stop with the needle in the down position to allow for pivoting or more accurate free motion work. To move the needle up or down as desired, simply press the needle up/down button. Truly Illuminating The new, bright-white LED lighting, provides an illuminated view of the sewing area and allows for more precise sewing. 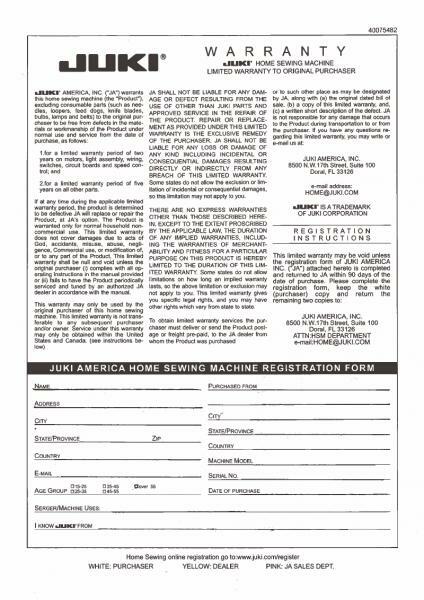 Automatic Needle Threader The push lever automatic needle threader easily threads the needle without eyestrain and allows you to start sewing quickly. Easy Bobbin Replacement A new bobbin case latch and an enlarged bobbin case area make it easier to remove and replace the bobbin. Nothing Free Motion Quilts Better Than a Juki Juki's rich tradition in quilting continues with the TL-2010Q. The feed dog can be raised and lowered simply by depressing a switch. When quilting, the drop feed allows you to sew curved stitches with precision and ease. Juki 1/5 Inch Quilting Foot The Juki quilting feet are designed for free motion quilting and free-hand embroidery. Just lower the feed dogs and stitch away. Included with the TL2000Qi is the 1/5 inch free motion foot. Juki Even Feed Foot With its reliable feed, the even feed foot ensures the machine's ability to produce beautiful seams when sewing difficult-to-feed fabrics such as georgette and velvets, as well as heavy weight materials such as leather. Knee Lifter Lever The knee lifter level allows you to lift/lower the presser foot without using your hands. The presser foot can be raised as high as 12mm. Overall, shopping with AllBrands.com was a pleasant experience. I had difficulties with the web site that resulted in not being able to order the specific product that I wanted, but the customer service representatives and supervisors went out of their way to make it right. I would recommend AllBrands.com as a good place to shop. I couldn't believe how fast I recieved my machine! I love it, am more than happy with the workmanship of the sewing machine. I received the Juki TL 2000Qi Quilting Machine and I absolutely love it.